Prana team member, Heather Cammaert is an excellent role model for what it means to exercise self care. She works sincerely and with great effort for the benefit of others, but she’s not afraid to take time to refuel her own tank. In Heather’s presence you’ll find her light-heartedness reminds you of times spent with an old friend. With these characteristics, why wouldn’t we bring her on board as a Prana team member? In 2014 that’s exactly what we did. 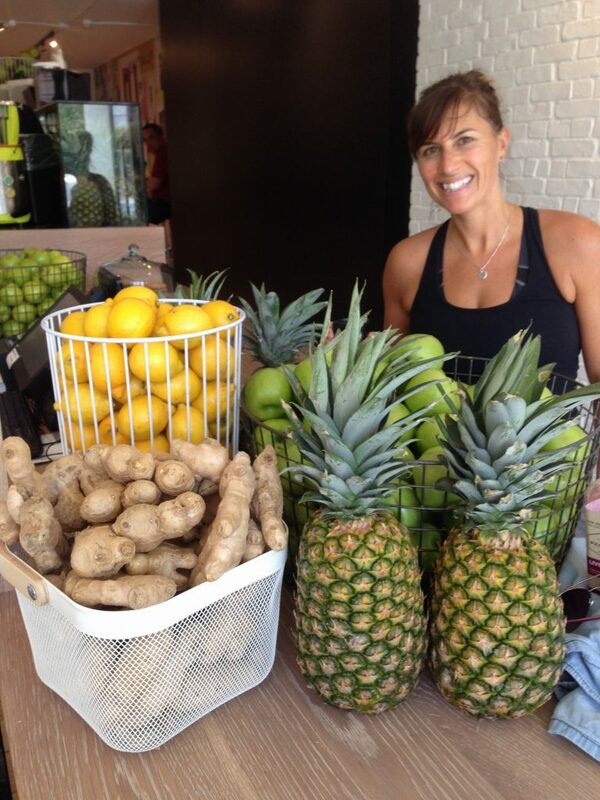 Heather waiting for fresh pressed juice after a yoga class. Heather’s class incorporates various approaches to yoga, thus making her teaching style intuitive and adaptable. She is good at sensing what her students need and delivering. Heather currently teaches lunch time yoga classes with our client, Thames Valley Children Centre and offers coverage for fellow team members’ classes to keep consistency and flow in what we do. You can connect with Heather about private individual or group classes at ahocammaert@sympatico.ca or also catch up with her at Fanshawe College in her Fitness 101 class– be sure to check the current schedule, as it changes each semester. 1. What style of yoga you teach and how do you describe your flow? My YTT training was Hatha Yoga including vinyasa, power and yin. I am eagerly learning Sivananda 🙂 The intention of my classes is for students to find a deeper connection with body, mind, and spirit and to leave with an open heart. 2. How long have you been practicing yoga? I was a small town girl for the first part of my childhood living in Teeswater, and then became a city girl when I moved to London in my early teens. We moved around a bit within the city and now continue to ‘grow up’ in the beautiful community of old south. 4. Where’s your favourite place to visit? My husband and I were introduced to a quaint and rustic summer lodge about 17 years ago and we have continued to visit Knoepfli Inn near Magnetawan, ON every summer since. It is our time to disconnect from the busy schedule of everyday life, and to spend quality time with the kids while fishing, boating, relaxing and lots of time for lakeside yoga!! I’d have to say that the birth of my two children would cover all of the above. Definitely strange and surprising, a tad bit embarrassing at times, but by far the two most wonderful, spectacular and joyful days of my life. I would say ‘vegetarianish’ but if you ask my kids they would say ‘vegaquarium’ because I eat fish. I’m not sure if this is a term, but they came up with it one day and it’s been an ongoing funny ever since. 9. What’s your hidden talent? I love collecting recipes and cooking in my kitchen, but I guess that’s not really a hidden talent. I guess I’d have to say riding a unicycle is something not everyone knows about me.